Located ideally just steps in either direction to the Village Lifts or Blackcomb Lifts. The Gables complex stands out from the rest for convenience and unassuming mountain country decor. Coupled with a well equipped townhome and great service - you will be thrilled with your choice here. Bedding is Queen Bed with pull out sofabed in the living room. 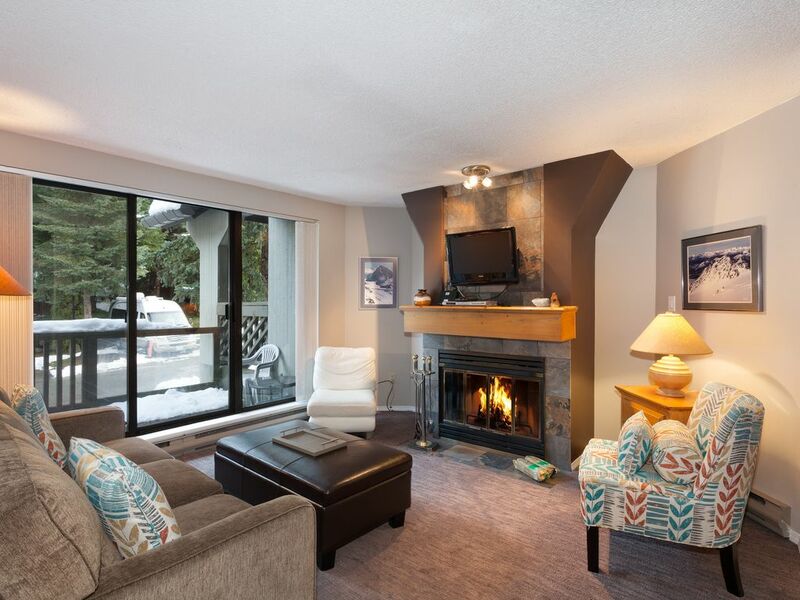 Under stated spacious and well equipped you will enjoy this Whistler townhouse rental for your short or long stay. Bedding is Queen in Master with a pull out sofabed in the living area. Vaulted ceilings highlighted with a cozy wood burning fireplace and deck! Free WIFI and flat screen HD TV in both living area and upper bedroom enhance your stay in time….Updated Bath May 2014. Ideally located within walking distance to all the activities Whistler has to offer. You will find Main lifts of Whistler Village out the front and to the right and with the Upper Village lifts just across the street. Take the back route along Fitzsimmons Creek only steps from the quaint covered bridge to parking lot 1 and the mid Village entrance. Excellent location and unit and loved where we stayed! Gillian, the property manager went above and beyond to make our 2 week vacation in Whistler awesome. A couple of things came up during our stay (loud neighbors up stairs) that she took care of right away. The condo is in a great quite location just outside, but just 3 mins walking distance to the main village. It was also nice to have a parking spot right in front of the unit. Looking forward our next stay there next year. i stayed at this beautiful apartment while in whistler and it suited perfectly. only a short walk to the lifts and walk into town. i would definitely recommend! We attended the PHE Canada National Conference in Whistler and found this little gem. This property is very clean and close to Whistler Village. Being located this close made it very interesting walking to the conference each and every day. I would recommend this location to any traveler who is looking for a nice quiet location with all the amenities. We really enjoyed staying here and if luck permits it we will stay there again. All the best!! It is the third time I stayed in Gables for my family ski trip. The last 2 were satifactory while this one unfortunately wasn't as pleasant. The house was not very clean, and the sofa bed was too old that I could hardly fell asleep throughout the night.